Count Dracula, Marvel supervillain. The Tomb of Dracula vol. 1 #10 © 1973 Marvel Comics. COVER ART BY GIL KANE AND TOM PALMER. Creatures spawned from mythology and cultural legends—minotaurs, sea beasts, fire-breathing dragons, abominable snowmen, and their ilk—are comic-book and cartoon staples, but several monsters made famous by novels and film have become so engrained as evil in the pop-culture psyche that they are regarded as supervillains. Frankenstein's Monster, who first appeared in Mary Shelley's 1818 novel Frankenstein, or The Modern Prometheus, was the obvious template for Superman's doppelgänger Bizarro, but has also appeared as a supervillain himself. “The X-Men Meet Frankenstein! Nuff Said!” blurbed the cover to X-Men #40 (1968), featuring a bolt-necked android bearing more than a passing resemblance to the Boris Karloff version of “the Creature,” as the Monster was at times called, in the enduring horror movie classic Frankenstein (1931). Superman encountered the Frankenstein Monster on several occasions, including Superman vol. 1 #344 (1980), in which the Monster pinned back the Man of Steel's arms while Dracula prepared to feast upon the hero's neck. The sympathetic nature of this man-made monstrosity has also inspired his portrayal in a heroic light in many comic books and animated television cartoons. The King of Vampires, Count Dracula, is also the king of comic-book monster-supervillains. 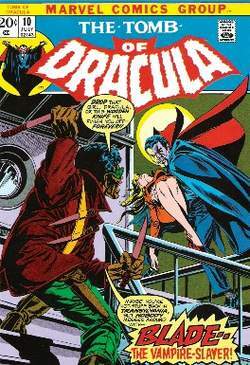 Marvel's The Tomb of Dracula (1972–1979), made famous by writer Marv Wolfman and artist Gene Colan, ran an astounding seventy issues and has enjoyed several revivals. Blending characters from the original source material, Bram Stoker's 1897 novel Dracula, with original characters such as Blade the Vampire Slayer and the diabolical scientist Dr. Sun, Tomb of Dracula coexisted with other Marvel Comics series. Wolfman and Colan generally chose not to exploit Dracula's Marvel Universe residency, although issue #50's battle with the Silver Surfer reminded readers of where the Count hung his cape. Because of their series' success, Dracula has been absorbed into the Marvel's pantheon of villains, combating Spider-Man, Dr. Strange, and the X-Men (Dracula and Spider-Man also clashed in the mid-1970s on TV's The Electric Company). Other comics publishers have fallen under Dracula's spell, although unlike the Frankenstein Monster, the King of Vampires has rarely been depicted heroically. Dracula occasionally flutters into the DC Universe, in vehicles such as Doug Moench and Kelley Jones' graphic novel Batman & Dracula: Red Rain (1991), in which Batman became a vampire. The Batman vs. Dracula (2005) was a made-for- DVD animated movie spin-off of the WB's cartoon series The Batman (2004–present). The King of Vampires has fought other famous heroes, including a famous ebon-garbed swashbuckler in Topps Comics' two-issue Dracula versus Zorro (1993). The Wolf Man, the personification of the ancient legend of lycanthropy (humans transformed into wolves), was popularized on the screen by actor Lon Chaney, Jr. in the Universal Pictures horror classic The Wolf Man (1941). Werewolves frequently serve as supervillains on the screen, in diverse works from The Adventures of Jonny Quest to Buffy the Vampire Slayer. Marvel's Werewolf by Night title was a 1970s favorite, with its tragic protagonist often regarded a villain by those he met, including Spider-Man and Moon Knight. Readers realized that, like many monsters, the werewolf was merely misunderstood. A supernatural gem caused astronaut John Jameson (son of Daily Bugle publisher J. Jonah Jameson) to mutate into Man-Wolf, another Spider- Man foe who starred in his own short-lived, mid- 1970s series (in the title Creatures on the Loose). Superman's Pal Jimmy Olsen #44 (1960) featured the red-headed cub reporter transmogrified into “The Wolf-Man of Metropolis” after a sip of a strange brew, while Superman and cowboy superhero the Vigilante tussled with a werewolf in World's Finest Comics #214 (1972). Writer Len Wein, with artist Neal Adams, pitted the Caped Crusader against a werewolf in “Moon of the Wolf” in Batman #255 (1974), a story Wein adapted to animation as a 1992 episode of Batman: The Animated Series (1992–1995). Frankenstein, Dracula, and the Wolf Man have occasionally united as a triumvirate of terror. They were played for laughs in the timeless movie classic Abbott and Costello Meet Frankenstein (1948), and were only marginally scary in the kid-friendly “The Transylvania Connection” episode of the animated Spider-Man and His Amazing Friends (1981–1986). A computer-generated werewolf joined Dracula and Frankenstein as the arch-foes of monster-fighter Hugh Jackman in the 2004 movie Van Helsing. Sweet-toothed breakfast-cereal lovers know this trio of monsters in their more palatable incarnations as General Mills' Count Chocula, Frankenberry, and Fruit Brute (along with their fiendish friends Boo Berry the ghost and the Yummy Mummy). Horror comics writer Steve Niles dug up some of these old childhood favorites for the four-issue miniseries General Mills Massacre (2005–2006), drawn by Stuart Sayger and published by AFD Press. Other famous monsters have inspired supervillains in comics and film. Robert Louis Stevenson's 1886 novella The Strange Case of Dr. Jekyll and Mr. Hyde and its “monster within the man” struggle gave birth to Batman's enemy Two- Face, whose Jekyll-and-Hyde actions are selected by the flip of a coin. Another Bat-foe, Man-Bat, experienced a similar, sometimes uncontrollable transformation from benevolent scientist to malevolent monster. DC Comics' Eclipso, when created in 1963, was billed as “Hero and Villain in One Man,” although his twenty-first century incarnation is exclusively sinister. Mr. Hyde, a researcher turned superhuman, is Marvel's most obvious variation on Stevenson's theme, but when Stan Lee and Jack Kirby co-created the Incredible Hulk in 1962, they did so envisioning their monster-hero as a modern-day Jekyll and Hyde. Movie monster the Creature from the Black Lagoon inspired the Devil-Fish, a foe in a 1974 Legion of Super-Heroes story, while Marvel baited the same waters in 1975 with Manphibian, seen in the black-and-white magazine Legion of Monsters #1. Swamp creatures are comic-book staples, although they, like Frankenstein's Monster, are frequently persecuted innocents just trying to weather another day. Sci-fi author Theodore Sturgeon's 1940 story “It” was an early example of a bogspawned menace, as were the Heap (first seen in Hillman Publications' Air Fighter Comics #3, 1942), the Incredible Hulk's foe the Glob (Incredible Hulk vol. 2 #121, 1969), and DC's Swamp Thing and Marvel's Man-Thing, both of which were created in 1971. There is no mistaking the intentions of Solomon Grundy, the maleficent marshman first seen in 1944—he is unquestionably evil. The Yeti, the primate-like giant rumored to roam the Himalayas, prompted the creation of the 12-foot android the Shaggy Man, who first clobbered DC's heroes in Justice League of America #45 (1966). Immoral soldier General Wade Eiling transferred his intellect into the Shaggy Man's shaved synthetic body and attacked the League as “the General” in JLA #25 (1999). The Yeti-like Hulk—not the incredible green-skinned monsterhero, but the 15-foot furry alien criminal that crashlanded on Earth in Journey into Mystery #62 (1960)—was conceived by Lee and Kirby as one of the many one-shot monsters stamping through Marvel's horror anthologies before later being renamed Xemnu the Titan and recast as a Marvel supervillain. Xemnu ultimately became a comic-relief monster, due to John Byrne's less-than-reverent handling of the character in several late 1980s–early 1990s issues of The Sensational She-Hulk. Colossal threat King Kong is a popular supervillain, starring in numerous films and comics, and influencing imitators like Titano the Super-Ape and Konga. Godzilla, also the star of a long-running film franchise, became a Marvel Comics supervillain in a 24-issue run of Godzilla (1977–1979), in which the King of Monsters was challenged by numerous heroes including the Fantastic Four and the agents of S.H.I.E.L.D. (concurrently, writer/artist Jack Kirby's unsuccessful Devil Dinosaur series was published by Marvel in 1978, lasting only eight issues). Dark Horse Comics picked up the Godzilla license in the late 1980s and published several Godzilla series, some of which featured covers and/or interior art by fanfavorite Arthur Adams, a dedicated Godzilla toy collector. Two one-shots pitted the monster against larger-than-life heroes: Godzilla vs. Barkley (1993) brought basketball great Charles Barkley to comic books, while Godzilla vs. Hero Zero (1995) featured the monster and the size-changing superhero toppling skyscrapers at the San Diego Comic-Con. Dark Horse has also translated movie monsters the Aliens (the face-hugging breeders first seen in Alien, 1979) and the Predators (the human-hunters originating in the film Predator, 1987) to comics in numerous series, portraying them as supervillains in several crossovers with DC Comics including Batman versus Predator (1991–1992) and Superman vs. Aliens (1995); the legendary Ape Man also battled a Predator in the miniseries Tarzan vs. Predator at the Earth's Core (1996). These evil extraterrestrials clashed on the big screen in AVP: Alien vs. Predator (2004), but in fact their enmity was rooted in Dark Horse stories, beginning with the first Aliens/Predator crossover in Dark Horse Presents #34–#36 (1989). Among the many monster supervillains/antiheroes introduced by Marvel Comics in the 1970s were the Living Mummy and the Zombie; they, along with Frankenstein, Warwolf, and Vampire by Night, joined forces in the miniseries Nick Fury's Howling Commandos (2005–2006), featuring a “shock and awe” covert unit of supernatural operatives.